Legend: In Polonnaruwa to the north of the Pothgul Vehera is a granite boulder, adorned with a large statue. This is one of the finest statues in the Island and measures 11 feet 6 inches in height. The historians and the archaeologists have not confirmed its identity to date. 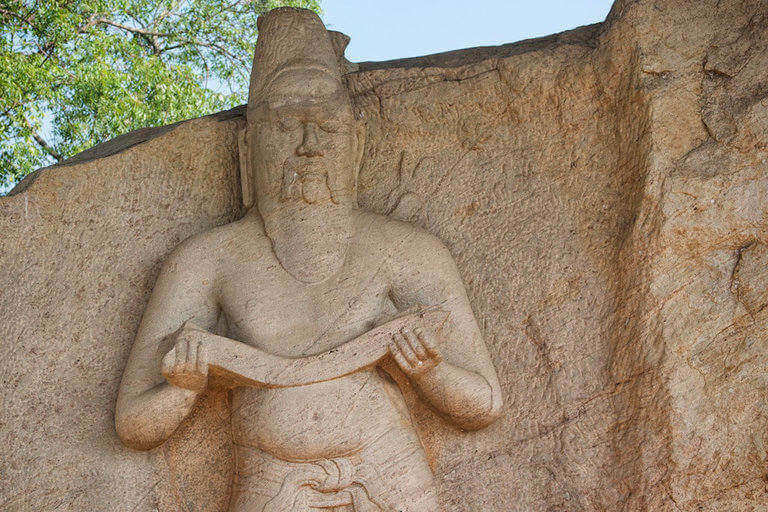 Some refer to it as the statue of King Parakramabahu because its closeness to one of his major irrigation works; others refer to it as Rishi Pulasthi’s statue. The presence of a Brahmanical sacred thread that runs from the left shoulder across the body and the Ola leaf book that he carries confirms that it is of Rishi Pulasthi.